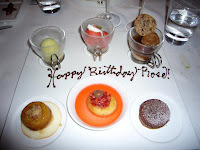 I went for one of my Birthday Dinners in 2006 and did the 7-course Seasonal Tasting Menu with the Wine Pairings. Every dish was in 'Trio' style. I had told the restaurant that it was my birthday when we made the reservation and let me tell you, not only did they have thoughtful handwritten birthday card signed by Michael Mina (I'm sure he just signed the card, but hey, it was the thought that counts, right? ), but they also gave us extra courses as well as extra glasses of wine & champagne. Needless to say, I was pretty plastered by the end of the night. So anyway, because there was so much to the meal, I honestly couldn't even tell you about what I had. It was a Gastronomical Overload. 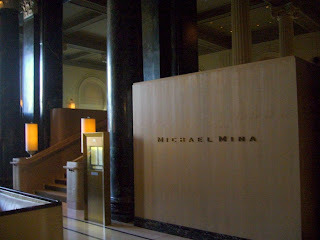 Because of this very fact, I would say that Michael Mina's was memorable, more so for the Experience. Don't get me wrong, the Food was great, but I probably would not do the 7-course meal were I to go again. 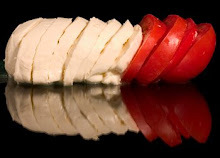 Click here for to connect to Michael Mina.